Iv had a few folk get in touch and ask about Carb Counting. What is it, and How's it done? So as best I can I'm going to explain my regime, but remember everyone is different so please speak to your diabetes nurses about what would best suit you. I have completed a DAFNE course to formerly learn how to match my insulin doses to the carbs I eat, and Iv been doing Maths ever since. 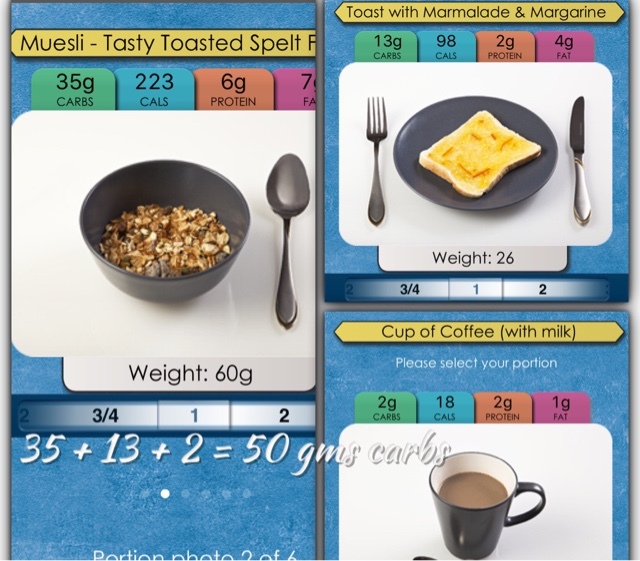 DAFNE stands for "Dose Adjustment For Normal Eating" and its a way of managing Type 1 diabetes for adults it gives us the skills we need to estimate the carbohydrate in each meal and to inject the right dose of insulin. The aim of DAFNE is to help you lead as normal a life as possible, while controlling your blood glucose levels, while reducing the risk of long-term diabetes complications. DAFNE usually involves attending a 5-day training course (9am to 5pm Monday to Friday) There are usually 6-8 participants under the supervision of the DAFNE-trainers. The DAFNE course is about learning from experience. During the week you practice the skills of carbohydrate estimation and insulin adjustment. Now after doing the course and graduating with what felt like a degree I thought, that's it, Iv got this well sorted, and to a point I did, however other than counting the carbs to match the insulin dose I then learned that not all carbs are equal. Eg: 30gms of apple, 30gms of bread or 30 gms of chocolate, all have different effects and have different timelines for impacting on blood glucose. The Apple is a low GI food (high fibre whole food) and if I inject the correct amount of insulin when I eat the apple I'm sorted. The Chocolate: ( I adore chocolate ) has a very high fat content. If I inject the right amount of insulin when I eat it at say 8pm I may actually go low because the insulin is working but the chocolate is hiding. ( chocolate is not recommended for treating a hypo for this reason ) 4 hours later when I'm in bed the chocolate is now out of hiding. The insulin has taken its leave and if I wake through the night, the 8 I went to bed on has now multiplied itself by 2 under cover of darkness. Potatoes and Fruit have different effects on the blood glucose when eaten whole, than they do when you mash or pulp them. Mashed or pulped they hit the blood stream faster and can produce higher blood glucose because you'v changed the Glycemic Index ( G.I. ) of the food. 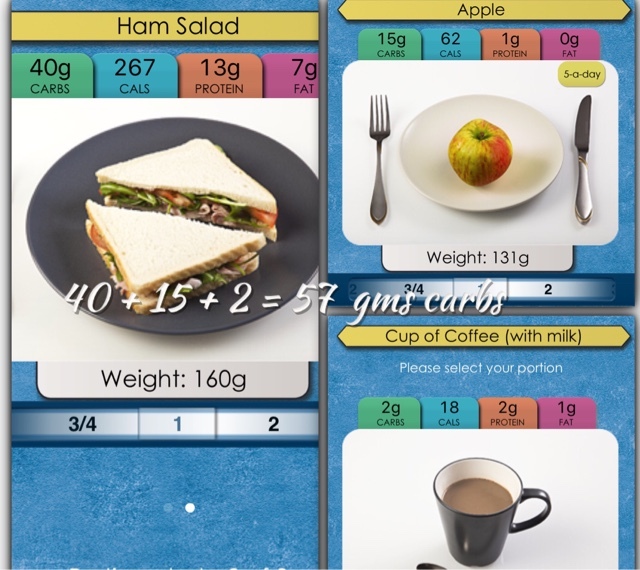 Living with type 1 diabetes is a balancing act, it's not only about counting carbs and calculating doses, it's about learning how different foods effect you. Its finding out how to deal with all types of foods, and timing insulin injections to catch the glucose on route. It's about educating myself constantly. It's about learning tips from others just like myself. It's learning when best to delay my dose, or split my dose. 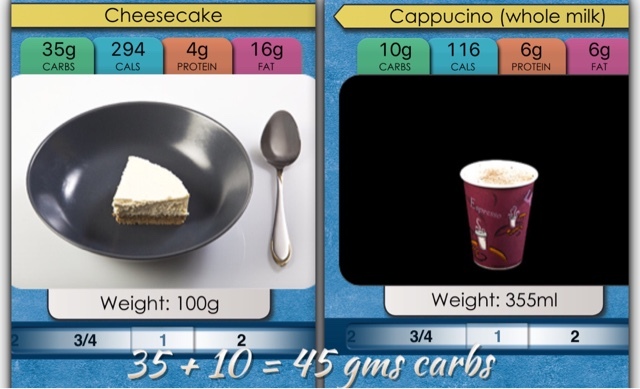 To start with matching insulin to carbs you must first have a "insulin to carb ratio" this is something your diabetes nurses will give you, everybody is different so others can't advice you on this. Mine is 5/1 that's 5gms of carbs to 1 unit of insulin. 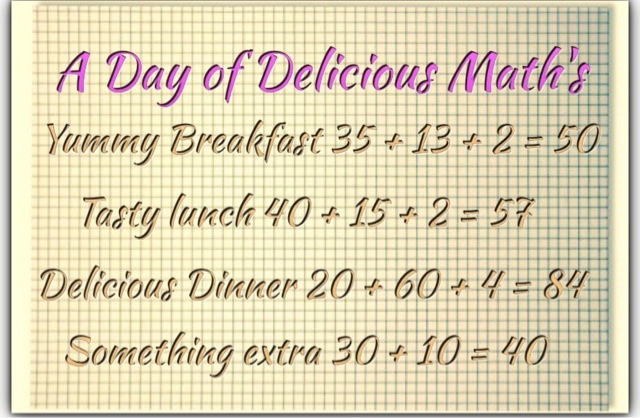 So if I eat something with 30gms of carbs I just do the sums. (30 divided by 5 = 6) so 6 units of insulin for 30gms of food in my case, presuming my blood glucose is 5 or 6 before I start eating. If not il adjust again either up or down to take in a correction. Iv added meal pictures to this blog so you can judge the portion sizes, remember the bigger the portion the more carbs there are. 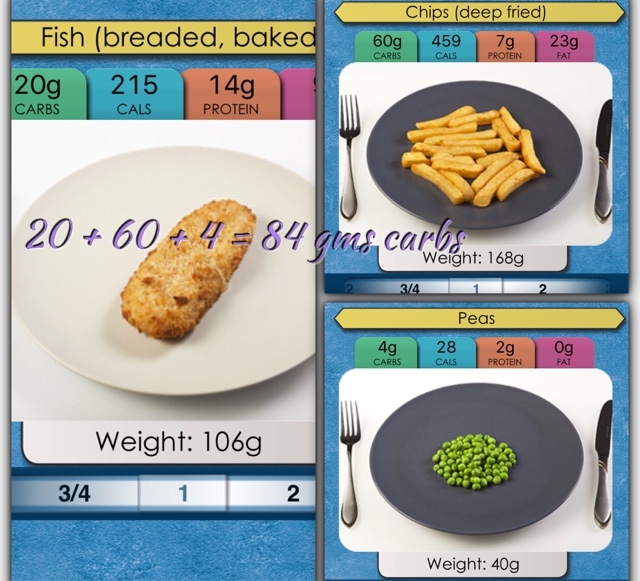 The pictures are from the Carbs and Cals app on my smart phone. The only app Iv ever paid for and it was worth every cent. It is also available as a book but the app is always with you and is updated regularly. I hope some of this may help others ! 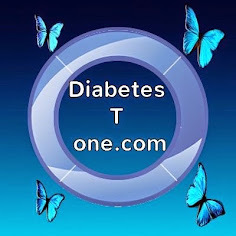 I'm not a professional I'm just a person with type 1 diabetes sharing experience.